Draftstars launched early in 2016 with the aim of becoming the largest daily fantasy sports (DFS) platform in Australia. Draftstars was originally a joint venture between Australian sporting juggernauts CrownBet and FoxSports, but has since been acquired by an even bigger name in the daily fantasy sports arena, PlayUp. Make sure to read on to learn more about the site, including details of how DFS works in our Draftstars review. As soon as you load up Draftstars it is very clear that they are one of the best Australian Daily Fantasy Sports websites. Not only is it easy to create a Draftstars account and get started, but choosing a Daily Fantasy contest is also simple with their easy to navigate tournament lobby that has since been upgraded with the new ornership. Draftstars offer DFS contests in a range of sports including AFL, NRL, NBA, NFL, Cricket and Soccer and they will no doubt continue to add sports to that roster as they grow. AFL Daily Fantasy is certainly the flagship sport on offer at Draftstars. 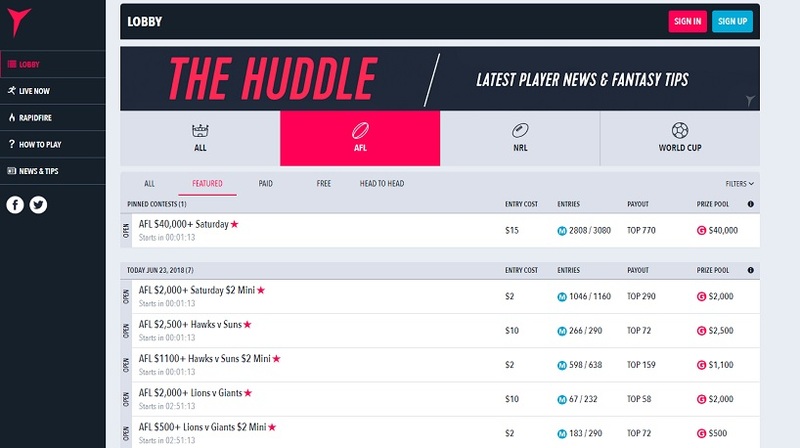 When Draftstars launched they ran AFL contests with $10,000 prize pools and now regularly run $50,000 AFL DFS contests - which is easily the largest DFS prize pool on offer in Australia. One of the key ways Draftstars separates itself from the competition is the implementation of 'DraftDay' software which is the platform used for the major billion-dollar Daily Fantasy companies in the USA. Any Australian who plays on Draftstars will quickly see this is some of the best DFS software available at the moment. We can only expect this seamless technology, which is already the best in Australia to get better after the PlayUp acquisition, as they have lots of experience to call upon in the DFS scene. Remember, Plenty of what you’ve come to expect from Draftstars has remained the same since the change of ownership. The popular contests haven’t changed, and the salary caps, scoring and player formats are all the same. There is also no need for any new action required on your account - your balance, verification and profile will all remain the same. Playing Daily Fantasy contests on Draftstars is very simple - even if you have never played DFS before. Anyone familiar with regular fantasy competitions like SuperCoach and DreamTeam will quickly learn how Draftstars operates with the main difference being that contests don't last all season, they last one game, one day or a single round or each sport. Basically, each Draftstars DFS content can be free or range in buy-in from $1 to $500. Each entrant in a specific DFS tournament is then given a virtual salary (usually $100,000) to use to select a team of fantasy players for any given game, day or round of a sporting event. For example: in the flagship major weekly AFL DFS contest on Draftstars, each player pays $15 to enter and has $100,000 to select an AFL team for the last six games of any given round, kicking off on Saturday afternoons. Every AFL player is allocated a salary based on their ability and average fantasy scoring - so someone like Joel Selwood is very expensive, while an unproven rookie will be cheap. The nuance in DFS contests such as those run at Draftstars is that you won't be able to afford all the best players. You will have to do some research and find out which rookies and cheap players are the best value. If your DFS team manages to score the most points against all other entrants in your tournament, then you will win and receive the largest portion of the prize pool! That means in the big AFL contest you can turn $15 into a massive $10,000 - all for playing fun fantasy sports games. If you don't win that's okay, because the top 15-20% of the field will usually at least double their money! Draftstars also runs huge NBA and NFL Daily Fantasy contests and it is expected their DFS prize pools will continue to grow!